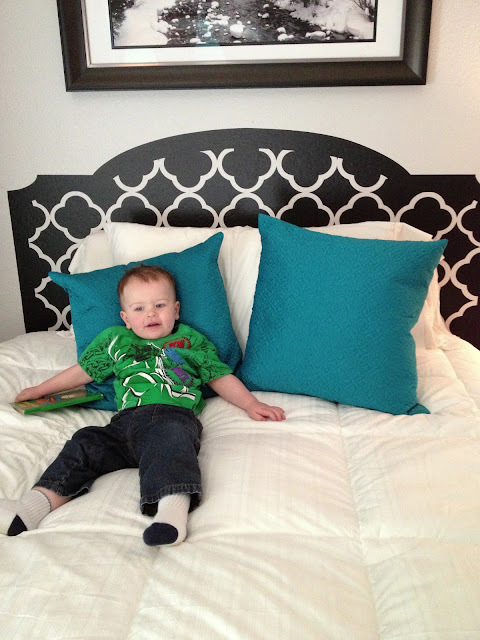 Bearcub Creations: A New Headboard! We are FINALLY starting to really decorate our bedroom. It's the room that keeps getting pushed aside as other projects come up. We've been purchasing things here and there for it but it never quite felt put together. If you follow me on instagram, you might have seen my new headboard. Now our rooms is a bit small. It is slightly bigger than the other, other bedrooms but it works for us. I tell you this because I've been wanting a headboard really badly but they are expensive whether you make them or buy them and they add about 3 inches to the length of your bed (a problem in our little room). 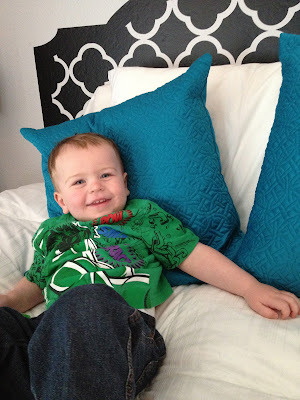 So I started to look around at Vinyl Decal Headboards. I wish there was more of a selections BUT I love the one we purchased. We purchased it through Amazon from a company called Trading Phrases. It was fairly easy to put up. It definitely took two people and it wasn't a fast installation but it went on very nicely. I love how it just helped the room look more finished! Aston thought it was pretty cool too. The pillows we purchased at Home Goods. I love that store! Hopefully I'll be sharing more of our room in the near future.